Otherwise known as Ebony. Has been tested PRA carrier. Ebony is Poppy's first born puppy. That is her at the top left hand corner of every page on this web site. Ebony is the lady of the house, or at least she likes to think she is. Quiet, gentle, tall, slim ,and elegant, and a girl who likes to wander off and do her own thing is probably be the best way to describe her. 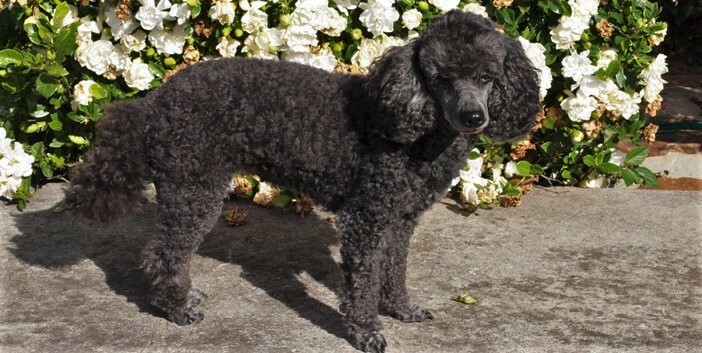 She is a really pretty dog, very intelligent, who loves having her picture taken, and she moves like a true poodle. If there is such a thing as a model in dog world, she is it. On the other hand, she is little miss bossy boots to the boys Charley and her brother Marley who is at the bottom of the pecking order, and she likes to make sure they stay there. She loves children, and jumps all over our grandchildren waging her tail when they visit. She has put up with a lot from the grandchildren with never a complaint. 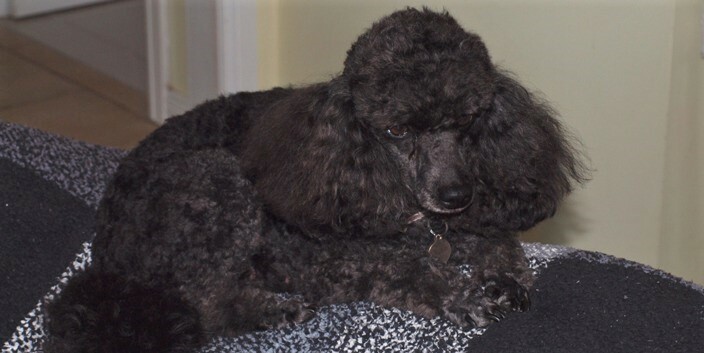 Young children are a good test of temperament in a dog and she passes with flying colours. Ebony believes in everything in moderation. So, she does not give face washes, cuddles are only for an appropriate period and at the appropriate time, and eating must be done slowly and in moderation. She was quite a surprise when Ruby had her puppies. She helped Ruby raise the puppies, and was more a mother to the puppies than Ruby. Ebony was an excellent mother to her own puppies, and the help was mutual. Ruby helped Ebony raise her puppies, even helped to feed them. A great relationship since if the famale dogs help each other there is far less stress on the real mother. In summary, a beautiful dog, and a real sweetheart. Daddy's sweetheart that is, because she is definately daddy's (i.e. Peter's) girl. Ebony had one litter of 4 puppies in September 2013. All were beautiful gentle natured healthy puppies. She had a second litter of 5 puppies in October 2014, and once again they were all beautiful gentle natured puppies. One of her puppies won first prize at the 2015 Bermagui dog show in the puppy section. She had a third litter of 6 puppies in December 2015. She does like to have big litters! Ebony's had her last litter in April 2017 and she has now be desexed and retired.